In the process of using computer, many users will encounter the problem that they need to resize partition, for example, the space of system partition often becomes inadequate, which may affect computer performance. In such a situation, the partition resize will be a better choice compared with the system reinstallation. Usually, users consider using windows built-in disk management tool to resize partition, which, however, will delete files of the partition. This article will teach users how to resize a partition without data loss. Now all you need is an excellent disk and partition management tool PartitionGuru, so that you can safely resize and split partitions without losing data. The partition resize process is straightforward and takes a very short time. Usually the partition resize involves two partitions, for partition resize is the transferring free space form one partition to another. If the partition being resized is system partition, the program will enter its DOS version and reboots Windows when the partition resize is completed. 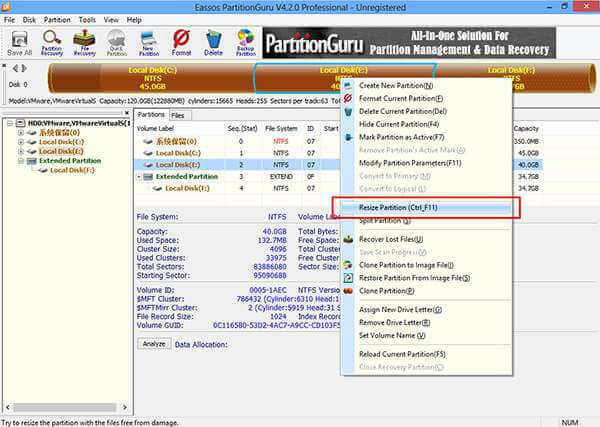 The partition resize with PartitionGuru doesn't cause data loss; besides, a partition can be divided into two partitions without losing data and for detailed steps, please refer to the article Split Partition.